In the spirit of Thanksgiving, I wanted to express my gratitude for various types of people who have had a positive impact on me and Stonemaier Games this year. Perhaps some of these people will be good resources for you as well. Backers, Fans, and Followers (Facebook, Twitter, e-newsletter, YouTube and new this year, Instagram): None of this would be possible without you. Thank you for supporting our games, and thank you for sharing them with others. My weekly Facebook Live chats in particular have been a lot of fun. Stonemaier Champions: I’m incredibly grateful for the 1,769 Champions who support the 100+ blog entries and 100+ YouTube videos I create each year for creators and designers, and having Champions use their free-shipping benefit (among other perks) to buy directly from us has been a huge help in stabilizing the sustainability of Stonemaier Games. Retailers, Distributors, and Brokers (retailers who sell our products, Top Shelf Gamer, MeepleSource, Greater Than Games): You are the backbone of our supply chain, as we no longer run Kickstarter campaigns. Thank you for being the bridge between Stonemaier and customers. I especially want to thank Alex at GTG, as he’s been an amazing liaison to have over there this year. Business Partners/Coworkers (Alan Stone, Morten Monrad Pedersen, Craig Moore): It’s so helpful for me to always have people who know the business as well as I do to bounce ideas off of, playtest with, be accountable to, and delegate to, especially in areas where I am weak and you are strong. Independent Contractors (Christine Santana, Jakub Rozalski, Dave Hewer, Laura Bevon, Agnieszka Dąbrowiecka, Valentina Filic, Soren Meding, Emilien Rotival, Katie Khau, Natalia Hargrave, Josh McDowell, Nersi Nikakhtar, Heriberto Martinez, Rom Brown, Robert Leask, Andrew Bosley, Jacqui Davis, Clementine Campardou, and others): Other than creating beautiful visuals, sculpts, videos, graphic design, and experiences for our fans in 2018 and beyond, I’m so grateful that these people communicate quickly and effectively–I highly value that. Lawyers and Accountants (Scot Duvall, Zachary Strebeck, Justin Marty, and Tony Aiazzi): I’m very grateful to have two great lawyers to help us create tight contracts, lock in solid trademarks, and protect our IP, as well as a great accounting and financial team. International Production Partners (Feuerland, Maldito, Phalanx, Matagot, Delta Vision, Arclight, Surfin’ Meeple, Ludofy, ALBI, Ghenos, Gen X, Moroz, Crowd Games, White Goblin Games, 999 Games, Spieleschmiede, Rebel, and others): Thanks to these partners, we’ve been able to reach tens of thousands of gamers who wouldn’t otherwise have access to our products. I really appreciate that these partners strive to meet deadlines for translations and payments. Replacement Part Helpers (Katy, Helen, Ben, Baron, Devon, Christian, Mark, Sean): To date, we have received and responded to over 10,000 replacement parts requests. I’m incredibly grateful to have these diligent helpers positioned around the world to take care of lost, missing, and broken components from our products. Automa: The inclusion of meaty solo variants in our games thanks to Morten, David, Lines, and other members of their team has been instrumental in extending our reach to solo gamers. I’m constantly amazed by how well Automa Factory is able to capture the feeling of a sentient opponent without requiring much upkeep or rules overheard. Dusty Craine at The Mill: I really appreciate that Dusty has created a YouTube channel specifically to talk about Stonemaier Games from a fan perspective. Our Facebook groups are great for those conversations, but Dusty really breathes life to our fanbase through The Mill, and we’re proud to support it. Digital Platforms (Tabletopia, Tabletop Simulator, Boardspace.net, ScytheKick, The Knights of Unity, Asmodee Digital, Mobo Studio, DigiDiced, and Daisu Games): The skill to take a tabletop game and translate it to the digital space for more people to discover, enjoy, and learn from is astonishing to me. I’m so impressed by and grateful for these folks. Several more of our games should be available digitally in 2019. Shipping and Fulfillment Companies (OTX, Spiral Galaxy, Starlit Citadel, Greater Than Games): While most of our games are shipped in bulk to distributors, we have offered more viable direct-shipping options this year thanks to these fulfillment companies. Co-Designers and Game Designers (Ben Rosset, Matthew O’Malley, Hoby Chou, Kai Starck, Ryan Lopez, Elizabeth Hargrave, Morten Monrad Pedersen, David Studley, Travis Jones): The talent and dedication of these designers is astounding, and they’ve become integral to our success. In fact, our only new games released this year–My Little Scythe and Between Two Castles of Mad King Ludwig–weren’t designed by me. Manufacturers (Shannon and Chris at Panda Game Manufacturing, Print & Play Productions, Inked Gaming): It’s a true blessing to work with a manufacturer like Panda, and it’s helpful to have great allies like Print & Play and Inked Gaming when we need a prototype, small-batch product, or print-on-demand product. Ambassadors: Our ambassadors have made my life so much easier by answering questions on forums, playtesting our games, proofreading all kinds of content, and analyzing our data. We currently have 1500 active ambassadors–I love that I can trust this group with ideas while they’re still being formed to get their feedback. I’m hesitant to mention anyone in particular, as so many people have contributed so much, but I do want to mention Josh, Charles, and Ashley. Translators: Localized games are great, but not all of our games are localized. Our amazing team of translators makes it possible for people to learn our games no matter where they live. Reviewers, Bloggers, Podcasters, and Video Bloggers: I can’t play every game, but thanks to the variety of perspectives from other content creators, I’m able to listen a variety of perspectives from the comfort of my office. These fine folks are also a key part of our marketing strategy so potential customers can know if our games are a good fit for them. Convention and Event Coordinators (Geekway to the West,Gen Con events team, Meeplesource at Gen Con, and any convention that uses the play-and-win system): It takes a lot of work to put together a convention. I’m so grateful for the people who create such welcoming environments for old and new gamers to commune with each other, as well as the volunteers who help us at those events. 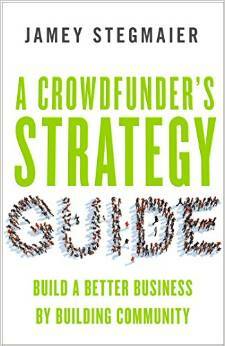 Book Buyers and Reviewers (A Crowdfunder’s Strategy Guide): I’m so grateful for those who bought my crowdfunding book, as well as those who also took the time to review it on Amazon. The more people do that, the more my book can help reach other creators who probably need the help more than you do. Blog Readers, Video Viewers, and Commenters (full KS Lesson list and game design YouTube channel): I don’t create content in a vacuum–I create it for you! I hope this blog and my YouTube channel add value to you, and I really appreciate when you join in the conversation. Design Day Attendees (2018 event): The creative energy and generosity of time and talent at our fourth annual Design Day was truly incredible. Thank you to all of the designers and playtesters who attended, and especially to Pieces Board Game & Cafefor being awesome hosts. Fellow Creators: I love that there are so many creative, innovative creators and game designers. You all truly inspire me to be a better creator and a more interesting game designer. Special thanks this year to Bezier Games for working with us on Between Two Castles of Mad King Ludwig. My Gaming Group: Gaming is my main social outlet, and I’m really grateful to have a consistent game group filled with people who love a wide variety of games. I like that these people try to win but focus on having fun, and especially that they hardly ever look at their cell phones in the middle of the game and that they’re nice to my cats. If you’re a fellow entrepreneur, for whom are you grateful this year? I’m grateful for you! I recently picked up a copy of your book and have been using your tips to prepare for our February Kickstarter. Your tips have been helping us tremendously. You even convinced me to start a blog. I am also grateful for my wife, friends, family, and all of our amazing supporters. As a new game designer it’s easy to get grumpy about how much of an uphill battle it is to get games published, but in context we have so much to be thankful for! It’s a privilege to be a game designer. Yay Dusty! I love Dusty! Thank you kindly, Candy! Big big love to you and the wonderful Stonemaier community. We have a great bunch of friends here! Very cool. Great list, Jamey. Thanks so much for the mention, of course I’m grateful for Stonemaier Games and the opportunities you’ve afforded me by sponsoring The Mill. It’s been a lot of fun, and that’s not even counting all the enjoyment the games have brought. I hope you had a great holiday.